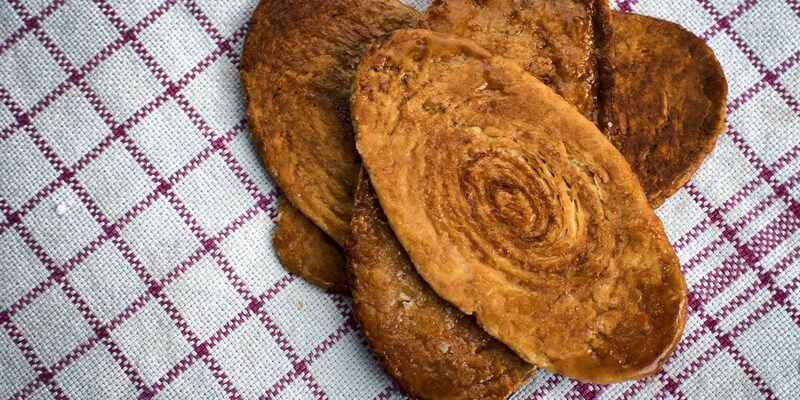 Arlettes are thin wafers of caramelised puff pastry originating from the south of France in the early 1900s around the same time as palmiers started to appear. As they are baked flat and do not need to rise, it’s a great way to use up any leftover puff pastry scraps – just combine them together and roll them out into a sheet. Traditionally arlettes are sprinkled with cinnamon but the spice can be omitted if you are using them as a component of another dish and therefore want them to be more plain. When dusting with the icing sugar before baking make sure to dust lightly as too much sugar will result in lumps of crystallized sugar which are undesirable to eat. If your baking trays are very light, weigh the top tray down with a heavy saucepan to make sure the arlettes stay very flat while cooking. Arlettes can be kept in an airtight container for 2–3 days. Cinnamon is the classic addition to arlettes but other spices can be used, why not try allspice, nutmeg or a soupçon of ground cardamom. Finely grated lemon or orange zest gives a nice citrus note or you could even try lavender. Arlettes are delicious served as wafers in a bowl of ice cream or with an afternoon cup of tea. For something a little more fancy, try layering arlettes with whipped cream or even crème pâtissière and fresh fruit to create a mille-feuille effect.